Officially called the Apple iPad Mini with Retina Display, the second generation of Apple's compact tablet will probably be known as the Apple iPad Mini 2 by many consumers. The original iPad Mini was a strong seller, but the lack of a full HD display meant that rival manufacturers were beginning to pose a serious threat. So this version upgrades the 7.9" display to a 1536 x 2048 pixel "retina" panel, but at the same time it also upgrades the processor to a 64 bit unit and refreshes the operating system to iOS 7 as well. If you've already seen the iPad Air, then the simplest way to describe the iPad Mini 2 is that it is a scaled-down version of the bigger tablet. Almost every major feature is the same, down to the screen resolution and cameras.. but the biggest difference is that the iPad Mini 2 is 34% smaller, 29% lighter and is about 20% cheaper. As with the previous model, the iPad Mini 2 has a 5 megapixel camera on the back, a 1.2 megapixel one on the front and all the usual iPad features. It is available as a WiFi-only model, or it can support either LTE/UMTS or LTE/CDMA cellular data depending on market, and it comes in 16, 32, 64 or 128GB versions. The basic model costs $399 / €389 / £319 for the 16GB WiFi-only version, going up to $829 / €779 / £659 for the 128GB 4G version. 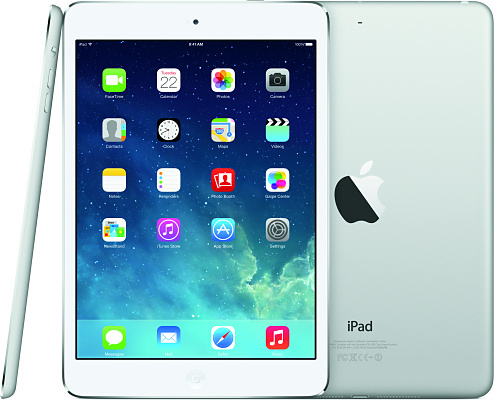 The original iPad Mini has been discounted to $299 for the cheapest version. Apple says that the iPad Mini 2.. errr.. iPad Mini with Retina Display should be available from late November in Space Grey or Silver colour schemes.